Welcome to the latest snippets from the crazy world of coffee cups and cafe society! Wanna follow something cool in Instagram? We recommend Coffee Cups of the World by Henry Hargreaves. And, because paper coffee cups are an artform, would you like another cool account to follow? Thought so. Then visit globetrotting artist Berk Armağan’s page where he use paper coffee cups as his canvas. What do you think about the ‘Bikini Baristas‘ scandal that’s ended up in the Federal court. Then Wendy’s got them back pretty good. More jobs in the coffee industry from Sprudge. 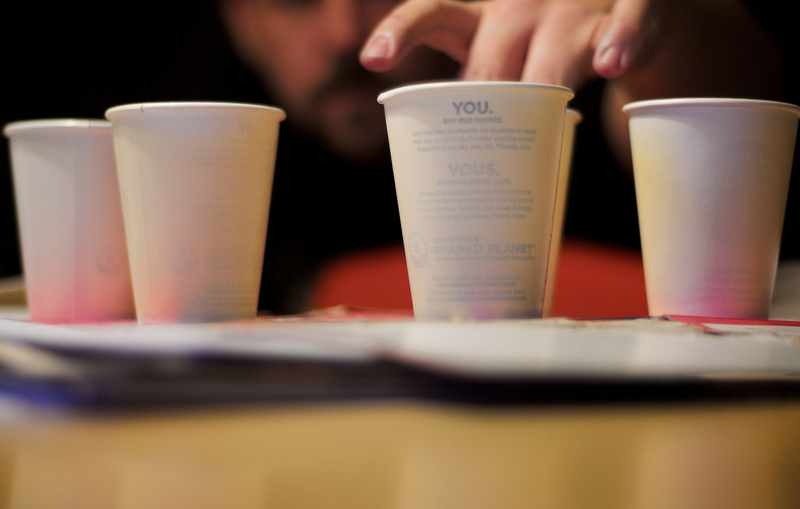 In case you missed our news about new recyclable and compostable paper coffee cups. Which is cool since G . F Smith have launched a new paper made from disposable coffee cups. Hopefully this will save Levi Hildebrand having so much coffee poured on his head. Or, if everything above is just too much to handle, you could just make a lamp out of a paper coffee cup instead. Check back for more thrilling instalments of random paper coffee cup news soon!